The mold spore happily made mycotoxin. It was a very successful mold. There was plenty of food for to digest and the air was quite moist. It enjoyed its existence growing on the side of this cardboard box in this warm, damp space. One day a bright light shone down like fiery death and something moved the mold spore’s world. The box moved and the spore swayed on its filament. 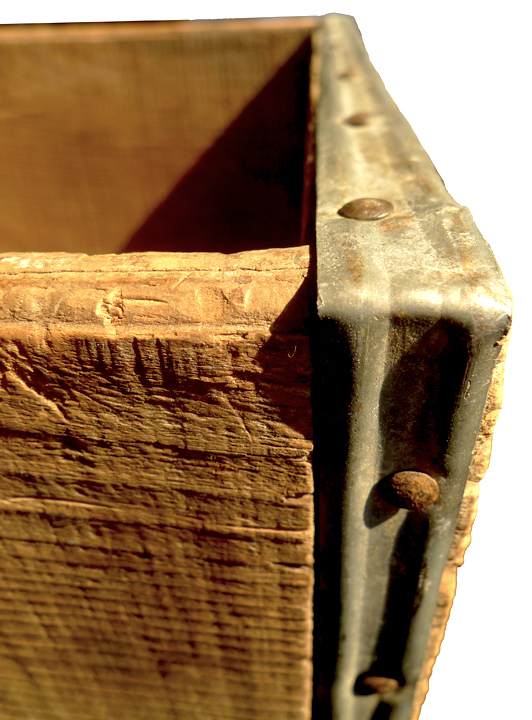 Suddenly, the box dropped sharply against the floor. The spore’s filament snapped and the spore went sailing into the air. It rose and fell with the air disturbance from the falling box. Suddenly a sharp current caught the spore and propelled it into warm darkness. Minerva sneezed and wiped her hands on her pants. “Ew, mold.” She went looking for a dust mask as she reached into her pockets for her inhaler. Minerva set the heavy tray on the table with a thump. A puff of white dust blossomed upward and made her sneeze. 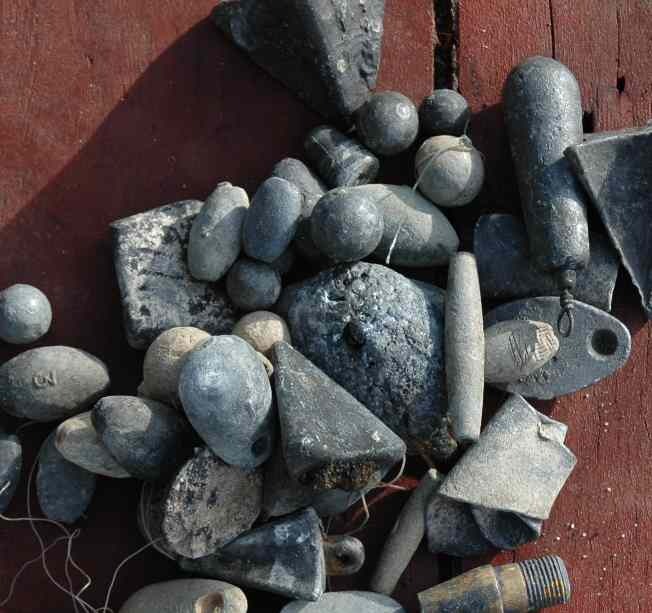 These old fishing weights certainly were dusty. She sneezed again. Somedays she really hated her predecessors. Whoever had thought it was a good idea to just throw these weights in a box without any kind of protection and stuff them up in the attic, was really making Minerva’s life difficult. She started pulling weights out of the box, white powder coating her fingertips. Some of them had numbers, but most seemed to be unmarked. Well, bugger. Hopefully the genius who put them in the box at least catalogued them. Minerva wiped her hands on her slacks and went over to the card catalog behind her desk. She pulled out the cards for “Fishing” and sat down to flip through them. As she sat down, her computer screen popped to life and indicated new email. She set down the cards and clicked on her inbox. After answering two research queries and one “What happened to the box of photo albums by the front desk?” email, Minerva grabbed two ibuprofen and washed them down with energy drink. She unwrapped a sticky nut bar and slowly ate it while checking other internet things on her computer. Minerva picked up the index cards and flipped through them scanning for the word “weight”. on “Fishing p.3” she found a listing for “144 Lead Fishing Weights from Todd Sanders estate.” She looked down at the powdery film still coating the backs of her fingers. She googled “Poison Control Hotline” and started dialing. Minerva jerked her hand, out of the map drawer, in pain. Blood dripped down her palm and spattered the old wooden floor. She wrapped her other hand around the wound. Something had cut her. Cut her bad. Blood welled between her fingers and soaked her shirt sleeve. Well, that was a lot of blood but nowhere near fatal. What was it, 2 maybe 5 liters depending on body size before someone bled out? Do non-writers have these kind of facts off the top of their heads? wondered Minerva as she opened the first aid kit on the wall leaving bloody smears on its pristine white plastic. She grabbed a gauze pad and ripped it open to press to the wound. Well, this was a fine start to the week. Six stitches, 2 hours in the ER (who says there’s no benefits to living in the middle of nowhere) and a unscheduled lunch break later– Minerva went back up to the attic to figure out what had cut her. This time she pulled the drawer completely out. Inside was a cloth bundle with a glinting blade sticking through the gray canvas. Minerva turned over the attached tag. It read, “Veterinary Equipment CAUTION Knife is sharp”. “Ow!” Minerva dropped the dirt-encrusted wooden crate, with errant nail back down on the table, and sucked her punctured finger. Thank God this day was finally over. She grabbed a band-aid and covered the puncture wound. It wasn’t the best, but it’d keep her from bleeding all over on the drive home. Minerva stacked up her paperwork and grabbed her keys off the desk as her computer shut down. Another workweek done. Minerva wiped sweat off her forehead as she tried to stop clenching her jaw. Just a few more form letters and this week would be done. She rubbed under her ear where the muscles were spasming. It really was warm upstairs. Had someone turned the heat on today? Her vision swam and she felt faint. Lack of oxygen? She’d just used her asthma inhaler twenty minutes ago. Minerva felt her pulse racing. Why wouldn’t her jaw quit spasming? “What is it?” asked Tilly. 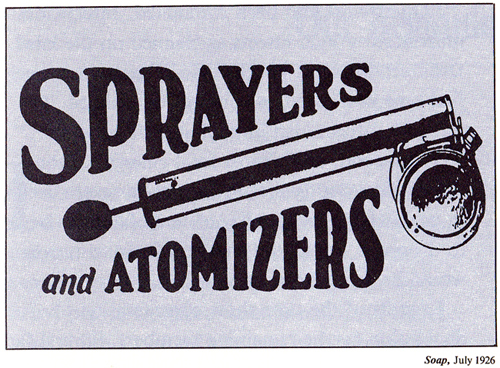 “Sprayer? How does it work?” Tilly peered at the device dubiously. “Yeah. Pull back that ball on the end and shove it forward real fast.” Minerva found the portrait and pulled it down from the shelf. Minerva turned and caught a cloud of insecticide residue in the face. Minerva coughed back a disgusted noise as she watched the Ghost Examiners “surreptitiously” turn off their handheld cameras. One of the audio guys shot her a dirty look. Minerva followed behind Eddie, as it became quickly evident that he wasn’t paying any attention to the heavy cord dragging behind him. She fed him cord and kept it from snagging or damaging any artifacts along the way. When he followed his fellow examiners into the jail, Minerva tossed the cord up over the two-thirds-wall between the exhibits so the dwindling cord would stretch. She leaned back against the railing of the fish-cannery exhibit and tried to tune out the driveling nonsense Napoleon Examiner was spouting about cold spots and feelings of oppression. Minerva heard someone walking on the main floor above. Damn it, which one of the crew had slipped away? She really wished one of her coworkers had been here to help supervise. Half the lights flickered on for a second. The half controlled by the light switch in the room right… oh crap. A loud thud came through the floor directly above the jail. Eddie sprinted out of the jail and ran past Minerva, knocking her half-way over the railing, her balance precarious. She heard the cord as it came loose from the wall and felt it thwap into her neck. The impact was just enough to send her over the railing, twisting the cord. There was no time for a breath. No time to call out. Minerva was going to haunt the crap out of those assholes. Minerva dragged one of the benches over against the basement wall and sat down out of the shot. The Ghost Examiners had only been shooting for an hour and she was already exhausted. She closed her eyes and leaned back against the wall as the Examiners traipsed up and down the stairs doing multiple takes of their intro to the supposed spirits that resided here. All the overhead lights were off and the crew were only lighting the Examiners. “Almost forty years ago a prisoner hung himself while awaiting trial,” the lead Examiner said for the eighth time as he tried to look suave coming down the stairs. Minerva sighed. There was no corroboration of that story in the records. Hell, there wasn’t even any mention of it in the records. It was just an old rumor probably made up by a long dead museum tour guide for the purpose of terrifying fourth-graders. Minerva opened her eyes. One of the Examiners—physically largest but clearly least intimidating— was pointing at an object to Minerva’s left. “Uh huh.” Minerva stuck her hand in the pocket of her jacket. “They used it to transport the bodies.” Her voice dropped slightly. “Sometimes you can still hear the scratching of the ones who weren’t quite dead.” She dragged her closed pocket knife against the metal chain behind her. The Examiner jumped back with an unmanly squeak and Minerva bust up laughing. The man took a step back and bumped into the smallest Examiner— the one with the napoleonic issue. Tiny t-shirt Napoleon put a hand on Minerva’s shoulder. She straightened to her full height forcing the little man to look up slightly, wrapped her hand around his wrist and removed his hand from her person.